Whenever fate demands me, I will go. and I am glad that it’s you this time. sorry for the late update, my house is renovating, and I am staying at my aunt’s condo for the time being. It’s a new condo, and there’s no internet line, I can’t online. I couldn’t have my blog updated! Went to Pyramid for a movie with Deric. 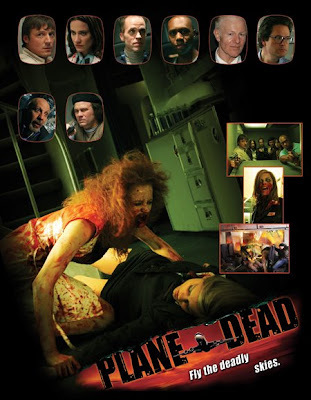 PLANE OF THE LIVING DEAD. The flight from LA to Paris turns deadly when the body of a scientist in a coffin is infected by virus which later on cause her to turn into a zomby. Basically, the whole movie is about zombies biting human, and human turn into Zombies and bite the others in a flying plane. There’s many blood scene which is pretty disgusting+scary. Oh yea, I personally love the prisoner. He is so cool. haha. I dressed up a lil diff from what I usually do. lol. Adele was surprise to see me dressed up like this too. Nic gave me a nicely wrapped present box. and these are what I found inside, together with a card. Early morning went to Pyramid and passed my laptop to Nic, he said he will help me to prettify my laptop. *wee~* He lend me his PSP because he is afraid that I would be bored without my laptop, aww, so thoughtful. Noon, Yonghui came to fetch me to Parade for interview. but, I RUNAWAY. my long lost pompuan. lol. I need a date with all my girls! Promised joe that I will go to work though I didn’t want to work there at all. Had breakfast with Deric before that, I make him wait for me for an hour plus because I was locked at the condo. so sorry. Work supposed to start on 11am, but I waited till 12.30 only I saw Joe came to open the shop. Went in to the shop I text him and asked what I could help, no response. I asked him what I can help face to face, no response again. wtf, I can’t stand his weird attitude any longer and so, I run away from work. Irresponsible I know, I am sorry to the boss, but, I have no choice. Hang out around pyramid, it’s effin boring. Deric came over around 8pm and he fooled me again. He called me up and said he is busy with his work and he might be late to have dinner with me. on the very next second, I see him. Jeff and Bryan came over too. Had dinner with them together with del. There was conflict between del and I. but I am glad that things are fine now. Since I am not working, and I told my mom I’ll be working, I decided to followed Del and the rest to Genting. Reached pyramid around 11am, Nic accompanied me cause the rest that suppose to meet up with me were late. Played pool with him while waiting. Deric reached around 12.30pm and we headed to AC. Played foos. I am a noob. sigh. After that, picked Adele up and meet up with Jeff at SS2. 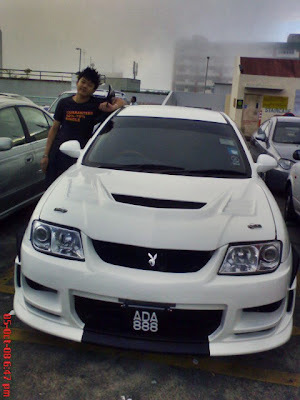 Went up to Genting by Jeff’s Waja Evo. The main purpose of us being there is to accompany Jeffrey to do his shopping. Shopping at Genting, damm cool right? all the way up there just for this. Adele with ” DON’T TRUST YOUR GIRLFRIEND” cap. We have nothing to do when Jeff is in the fitting room. nerdy specs and lalat shades. I bought a red top to match with Adele’s red top. After that, we went to CONVERSE. Jeff doing his shopping again. Lunch time. went to HOU MIN. A baby photo captured by us before we left. He even got a baby pink video player. Del with the pink pillows. After genting, we went to 1u. went to ADD-ON, and I pay YUHAO a visit. then they fetched me back to Pyramid. I’ll lay my love on you. After that, went back to Pyramid, met up with Deric and hanged out with him. Nic called, and said that my laptop is ready. He helped me to installed Windows Vista ultimate and downloaded a lot of movies and drama series for me. Nic sticked my favourite disney character on my latop for me. ern, it’s mickey actually, but well, Deric said it’s just the same. Pyramid AGAIN with the same people. Deric fetched Adele, Bryan and I to Parade to drop my laptop there for service then meet up with Jeffrey at Pyramid. Went to Kim Gary AGAIN for lunch. They were saying that I love sitting up straight. Jeff and Bryan tried to sit up straight too. After that, Deric suggested us to go for a movie since we have nothing better to do. Wanted to watch MAMAMIA but somehow we end up watching the lamest movie, CATACOMBS. ” SOHAI MOVIE, SOHAI PEOPLE WATCH SOHAI MOVIE.” Jeff said. seriously, damm SOHAI. the whole movie is about a prank, and that girl that got pranked end up killing everyone that prank her. In a nutshell, SOHAI la. Yet, I screamed a lot. when I know it’s all about a prank, I felt that I got fooled. *stupid* thanks GOD, Del was laughing CONSTANTLY beside me, must be Jeff cracked up so silly jokes again. Too much time, and have ntg better to do? Best movie if you want to waste your time. we then chilled around after the movie. adele. had been meeting up with her a lot lately. The self-claimed most “wai” person, Jeff. enjoy my poser photo with Deric. Picked up my brother then rushed home. Supposed to be back by 7pm, but I got back on 7.30pm. thought I would get screwed, but since my dad at home, my mom didn’t say anything because she doesn’t want me to get scold by my dad. Wow, it had been quite a long time din see you online, house renovating huh? no wonder. Cute pic! babe! miss you la. when hang out? ask mich to come along too. got a lot to update me wey haha xp ily! kido – cannot online made me even sadder. mon – finally we went out. wee~ thanks for being there for me when i m super down. lin – haha, ok, one day. hazuki – thanks for that. sarangheayo – who also wish me to be their baby girl?? sigh. not really.